Town hall. The town hall of Bruges is one of the oldest in the Low Countries and stood example for town halls that were built lateron in other towns. The richly decorated facade demonstrates the power the civil administration had [more info]. 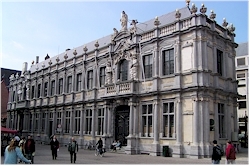 The manor of the Franc of Bruges. Text will follow shortly. The registry of the Franc of Bruges. Text will follow shortly. The Deanery of Saint-Donatian. 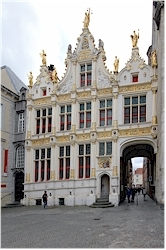 The former deanery is one of the few buildings in baroque style in the center of Bruges. It was built between 1662 - 1665 and is the only building of the Saint-Donatian complex that survived the demolition during the French occupation. Behind the deanery lays the official residence of the governor.